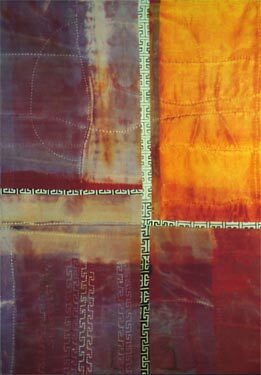 textile collage, size 42 x 51 in. 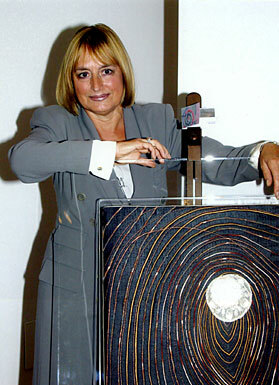 On 15 February 2006 my first solo textile art exhibition in Spain called Pintando con hilos was held at the Hotel Molino del Puente, Ronda. 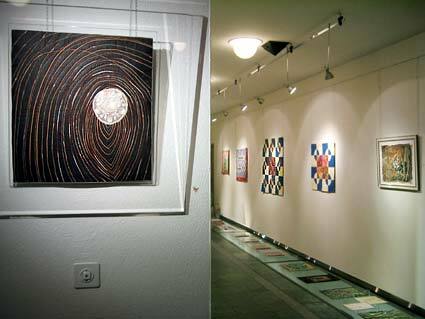 My textile art and sculptures have been on show there until end April 2006. Elaine and Ian, the owners of this beautifully renovated 17th century olive mill in the heart of Andalucia had generously reorganised their restaurant to make space for the hangings and sculptures. 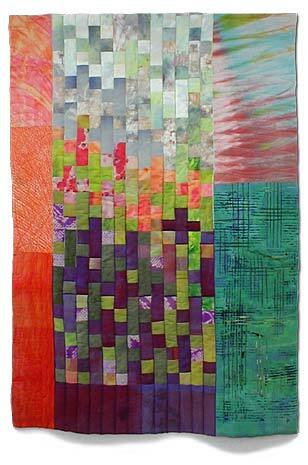 The international exhibition of 45 quilts from 45 quilt artists from seven countries and the USA was shown at Quiltfestival Hoeri 2005 at Lake Constance. The Quiltfestival (04.-29. 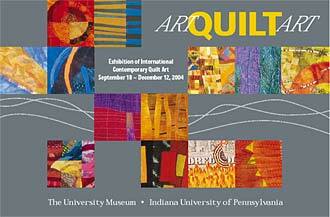 Mai 2005) also offered a variety of first class quilt and art quilt exhibitions and seminars. 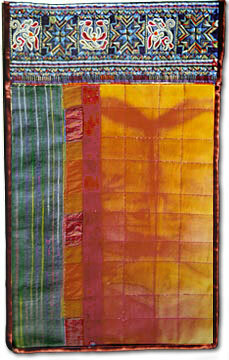 The contemporary art quilt movement has been growing internationally for more than two decades. 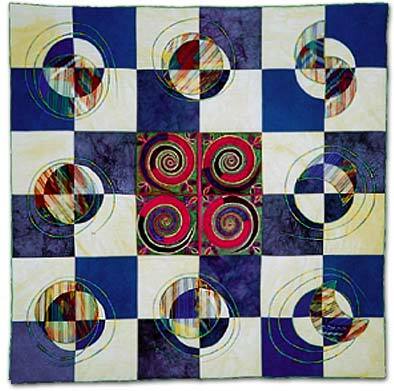 Leaders in the movement are responsible for encouraging those people working in the fiber arts mediums to step away from traditional patchwork quilting, and patterns and designs, in order to develop personal, interpretive, and innovative works of art. Most of the artists are involved in hand-dying, printing, stamping and painting their fabrics while some others research and find new technical methods to create the material with which they work. In this art form, fiber is defined in the broadest terms. 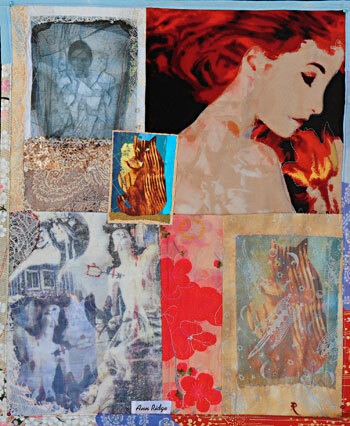 ARTQUILTART will bring to the regions where it is shown the works of more than 40 artists from seven countries worldwide. Each has been invited by Ned Wert, the exhibition curator, and former director of the University Museum, Indiana University of Pennsylvania. 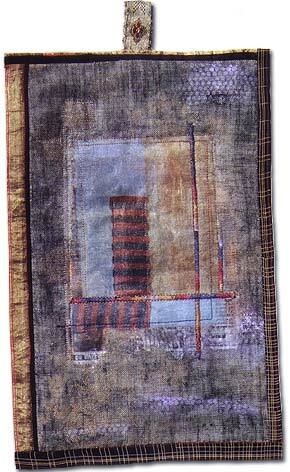 Included in the exhibition are works by world-renowned art quilters as well as newly recognized artists in the medium. Aranka Németh-Hopp and I went to the inauguration of ARTQUILTART to visit a part of the United States never visited before and to be with like minded people. It was a very important event for us to be selected as emerging artists in such an important venue. Our quilts were exquisitely hung by the Installation Curator, Sandra Kadlubowski. Many people who were seeing contemporary quilts for the first time were impressed by the beauty of the pieces exhibited and their presentation in this lovely museum. Group show "contemporary art quilts 2000" Cutting Edge Quilters in Uffington, Oxon, U.K. First juried contemporary art quilt exhibition in the U.K.
Group Show "CRAFT, EMBROIDERY & FASHION '97" held by Madeira Threads (U.K.) in Harrogate, U.K.
Group Show at Knapp Gallery, Regent's Park College, London, U.K.